We run monthly walking expeditions, taking a small group of people into the hills and mountains of North Wales, using a minibus that belongs to a local charity that supports people with addictions. It is common for people in recovery to be isolated and often lonely. Old friendships are not always appropriate, and new ones hard to establish. Friendships formed within the group can often make the difference between remaining in recovery rather than slipping back into relapse. 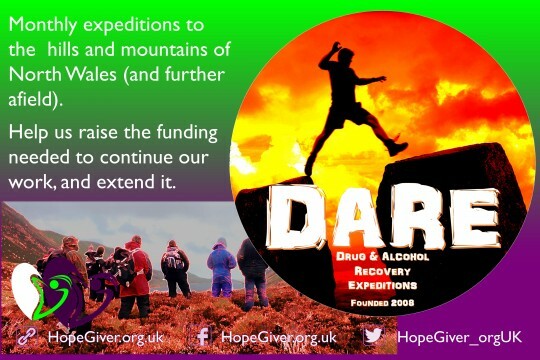 Reportedly, the longest running recovery group in North Wales, DARE exists primarily for Drug & Alcohol Recovery Expeditions, helping everyone in recovery (and those who support others in recovery) from any of life's hurts, habits and hangups, by taking them out onto the hills and mountains of North Wales (and further afield occasionally) and giving them a purpose and a hope for the future. Every month, we offer space for up to 16 people on our expeditions, which take people to the local hills and mountains. As a result of our work over the last few years, in particular, we have seen two exceptional individuals move forwards with their lives in such a positive way, that they will undergo mountain leadership training and will lead future groups. We need additional funding to continue our work, secure training, and organise expeditions further afield and for longer 2 -3 day treks.